Never a dull day at the Cinderella Project...especially when we are asked to help a young lady with her prom outfit with barely 10 days to the big event. No pressure! Not to make it any easier, typical tomboy Erin didn't want a glitzy, girly prom dress. It had to be a tuxedo. 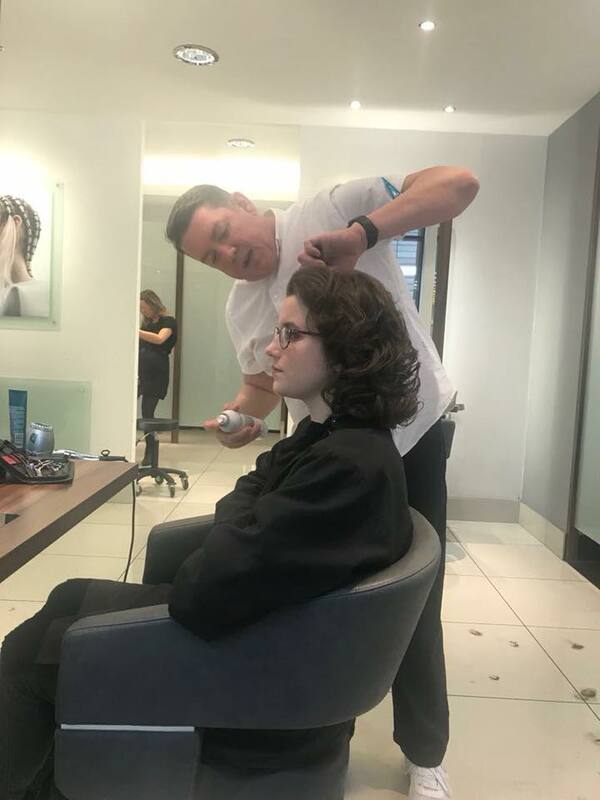 Thank goodness we have a great relationship with Slaters in Manchester who pulled out all the stops to make sure that Erin looked super-amazing at her prom. A proud moment for everyone including dad Patrick. "Hey my name is Erin, I was only 5 years old and just before Christmas 2007 my dad noticed that my head was leaning towards my right shoulder. He was very concerned and worried, so a few days later, he took me to see the doctor. At first, they said it was due to my swimming as I used to swim every Tuesday, so they thought I'd twisted my neck while swimming, but it turned out that they were wrong. My dad who wasn't convinced with their explanation, took me to Booth Hall hospital the next night where they found a tumour in my pineal gland in my brain. Since then it's just been operation after operation and bits of radiotherapy and radio-surgery. I'm now hopeful that this last blast I had on the 18th of June until 22nd of June this year has worked as I am now feeling a million dollars so yeah it's been a long journey which now has hopefully ended. After my radio-surgery I contacted the Cinderella project with the help of my dad and Manchester Children's Hospital as it was now less than 2 weeks to my prom. There wasn’t long to get ready. “In January 2014, 5 months after starting high school, I was diagnosed with a rare form of Acute Myeloid Leukaemia. My first stay in hospital lasted 18 weeks. Following 2-3 weeks at home, I was subsequently readmitted to hospital for a bone marrow transplant and had to be in total isolation for a further 8 weeks. I was then allowed home but had to undergo a further 6 months of semi-isolation. This meant that I was absent from school for around 15 months and was then only allowed back on a part time basis, as I still had to undergo a further 9 months of treatment due to the risk of my body rejecting the transplant. At times it felt like all my friends had moved on as I was still not strong enough or well enough to do the things that they could do, simple things like going shopping or hanging out at each other houses. My treatment has left me disabled. I understand that I will need further operations in the future to replace my knees, ankles and wrist joints as well as having a metal plate in my shin. Due to the harsh treatment, I lost all my hair (it used to be strawberry blonde and was 28 inches long) I am also covered in scars and stretch marks and have been told to expect to be on some form of medication for the rest of my life. I have missed around 3 years of school in total but I have worked really hard and managed to catch up enough so that I am able to take my GCSE’s with the rest of my peer group. I also get to go to my school prom this year. This is the one chance that I get to be like all the other girls the same age, although I do not look like a typical teenager anymore, I have scars, my hair is short and everyone else will be taller than me. I was so happy to be nominated for the Cinderella Project. It has been amazing so far. I loved visiting Diamante in Bramhall where the team were wonderful, nothing was too much trouble for them. The Cinderella Project has made me feel like a princess but most importantly like a normal teenage girl who despite everything that has happened to me, can now attend her prom just like her friends, feeling beautiful and confident." “The whole prom experience was amazing. Nine months ago I didn’t think I would be well enough to attend, but I felt amazing on the night. I met eleven of my friends and we all went together in a limo to the prom. It was great to be with my friends again after spending so much time in hospital. “Katie was diagnosed suddenly in September 2017, after showing no symptoms, with a rare form of neuro endocrine cancer. The cancer was found in her liver, pancreas, spine and lung. We were told that as the cancer was so rare and so widespread, the doctors were not sure if chemotherapy would work, so they would scan after 2 rounds of chemo. The second dose had to be reduced in strength as it made her so so ill. She ended up in hospital for about 6 weeks. She didn’t eat for about 12 weeks and lost so much weight. They insisted on putting in an NG tube to give her feeds which she hated. They applied for her to have a different anti-sickness drug and after this she seemed to pick up a bit and start to eat. Slowly her assertiveness or “Katieness” as we call it, began to come back and she fought her case to take out the NG tube. To date, Katie has undergone 6 rounds of chemotherapy. After the last chemo in February, she began to gain her strength and began to regain her appetite once again. It was only really at Easter time that she was strong enough to look at prom dresses. We had discussed prom before this but she just wasn’t strong enough to get her head round going shopping and she was so thin that I had no idea what size she would be by the time the prom came as I knew she needed to put some weight back on. Thankfully the tumours have reduced in size but left her with compression fractures in her spine. The cancer has now gone from her lungs but the doctors are not sure if the mass they can see on the scans is now dead cells or active cancer cells so Katie will now have another scan in June. If it has grown - more chemo will be necessary. The Christie hospital have now sorted out tablets hence her line could be removed. The Christie clinicians have shown a great interest in Katie as this tumour is so rare in adults and especially rare in children. Our lovely Teenage Cancer Trust, Youth Support Co-ordinator from Manchester Children’s Hospital Nicola mentioned about the Cinderella Project. What a God send! Just from the point of me hating shopping for a start, I really had no idea where to start looking for dresses. Katie has only just had her Hickman line removed (the Sunday before we came to see you on the Tuesday). This was also a consideration as Katie would feel so self-conscious of the line had it still been in. She was originally looking at dresses with one shoulder strap to cover the line. Away back in February we had the privilege of meeting and styling the very lovey 15yr old Casey Jones for her prom. Now we are able to reveal exactly what she chose. 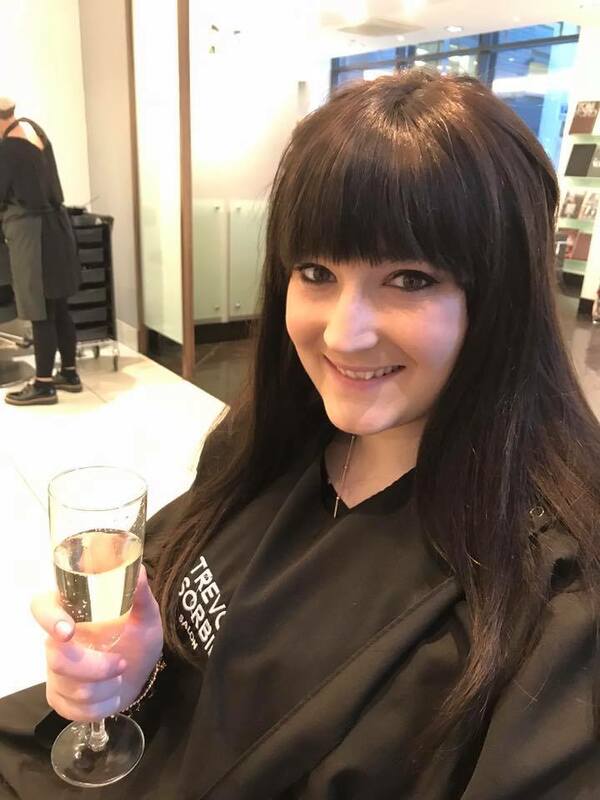 Casey had a fabulous makeover at Harvey Nichols Manchester followed by an evening she will never forget! Once again huge thanks to Diamante Bramhall for their help with our Cinderella's! “I had multiple lumps in my neck and under arms, we went to the GP numerous times over a time period of six months, until finally I was diagnosed. I had my first round of chemo on the 28th December 2016 and they blasted me with it for a further 6 months. I then then had 15 days of continuous radiotherapy. I was weak and tired all the time limiting my ability to do all the things that I had enjoyed previously. After I finished my treatment I was cleared of any cancer 😍 I am now thankfully in remission. Having cancer made me take action to improve my life. I picked up my studies at school and started an amazing drama group run by the fabulous Ross Adams. Ever since I was a little girl I had always wanted to be in the spotlight. I have dreamt of my prom since I was 11 years old. As I realised my prom was nearing, I contacted The Cinderella Project to help me fulfil my dreams of having the perfect prom night. When prom night arrived, it was one of the most amazing experiences of my life and wouldn't have been made possible without the Cinderella Project. I had a really special night with friends feeling good with how I looked"
After two and a half years of treatment for acute lymphoblastic Leukaemia, Lydia Greenwood got to ring the end of treatment bell at the Christie Hospital and there is no better way to celebrate than to have a party! We wanted to help this lovely and very deserving young lady who performed on our Concorde Catwalk last year to feel uber- amazing this evening, so we sent our lovely Wendy to help get Lydia ready via our Cinderella Project. Lydia who had already picked out a fabulous outfit with the help of Wendy, had a very special pamper session today at Harvey Nichols courtesy of Dora from the Shavata Nail Studio and Fran from Stila. This was followed by a hair styling appointment with Paul from Trevor Sorbie. I think you will agree that Lydia looks a million dollars. Lindsey who was diagnosed with soft tissue sarcoma, is being looked after by the Teenage Cancer Trust’s Young Oncology Unit at the Christie Hospital. In 2016 she underwent extensive surgery to her right leg as well as chemotherapy and radiotherapy. In March 2017 she underwent further surgery to her lungs. Then, in late 2017, the doctors advised that Lindsey’s best chance of recovery would be to have an amputation, so in December last year, she underwent further surgery. Despite these setbacks, Lindsay is full of hope and determination to get back to enjoying life including her hobbies of singing and acting. We have no doubt that this brave beauty will continue to inspire others with her can do attitude and positivity. Here’s what she had to say…..
Big thanks to the staff at Debenhams, Trafford Centre, Trevor Sorbie Salons, Manchester, Harvey Nichols, Manchester, & BK Executive Cars for helping make Lindsey’s day very special.